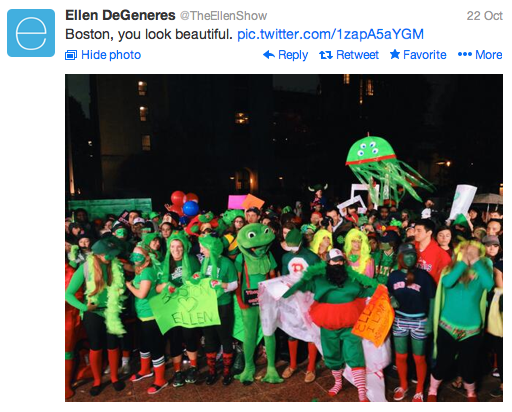 Last month, Ellen DeGeneres sent out these tweets to her 23 million followers, which quickly went viral among BU’s campus, Red Sox Nation, and the rest of Boston. With such a large online following, Ellen’s social media presence is one of her greatest communication assets: within a matter of two or three hours, thousands of green monsters showed up at Marsh Plaza to participate. From a PR standpoint, it was awesome to see Ellen hone in on Boston, especially with the simultaneous advent of the World Series. By focusing her World Series ticket giveaway in Boston, in a timely manner, she was bound to have a successful PR stunt. Ellen got the entire city buzzing without actually being in Boston. Her name, brand and status within the entertainment industry carry so much weight that she can send her assistant, Jeannie, to almost any location and expect an amazing turnout. As a spectator, it was amazing to see the kind of crowd and enthusiasm she stirred up while being all the way across the country. After some light rain, a beautiful sunset, and a double rainbow, Ellen made an appearance via Skype to give away the grand prize, a pair of Red Sox World Series tickets and $5,000 to a lucky Boston University student. Ellen’s successful combination of social media with the timing of the World Series in one of America’s strongest cities was absolutely a PR success. You can watch Ellen LIVE in Boston here.